When you lose a spouse, there’s an inevitable grieving period which is accompanied by a roller coaster of emotions. When you think of this grieving process, you probably associate it with loss due to illness or tragedy, but what about divorce? 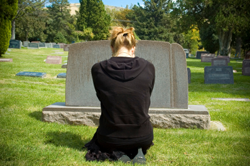 When partners divorce, there’s still a grieving process that goes along with the split. Divorcees need their friends and a support network just as much as a widower. There’s still sadness, anger, denial, confusion and strong emotions. Here, we’ll look at the similarities and differences between the two types of loss so you’re better equipped to deal with your own situation or help someone else through the grieving process. It’s important to understand this and avoid making statements like, “you made the right decision or you’re better off without him/her.” While these sentiments may be true, they do little to help a person adjusting to life without their partner. Whether you’re experiencing loss from death or illness or divorce, you’re entitled to your feelings. Don’t fool yourself or let anyone convince you that you shouldn’t feel a certain. You may need some help dealing with these feelings, however, so don’t be afraid to seek out counselors or support groups who may be better equipped to help you cope with your feelings. Anger is part of the grieving process. You may be angry at your partner for leaving you all alone, angry at the circumstances or at a higher power. Many divorcees, however, are also angry at themselves. As my clients go through the grief process, some of them feel that the years of marriage have been wasted time,” says Nanda Davis, a family law and criminal defense attorney and the owner of Davis Law Practice. “I encourage them to forgive themselves for the choices that led them to be in a marriage that ended. There’s a lot of focus on forgiving those who hurt you but not enough on forgiving yourself. I also try to help them see that this is not actually wasted time, just a chapter in their lives. The time you spent with your partner probably wasn’t all bad, you shared memories and had fun times and you may even have children together. Don’t think of this as wasted time, it will only add to your anger and keep you from being able to move on. One of the key differences between these two types of loss, is that in many cases, you may still see your ex-wife or ex-husband after the split. Maybe you have kids and you share custody, or maybe you still travel in similar social circles. It’s in situations like these, where the anger hasn’t subsided, where people have a tendency to compare the two scenarios. A divorcee might remark to a widower, “at least you don’t have to see your husband or wife anymore.” The truth is, these statements aren’t helpful to you or anyone else and certainly will not make someone who has lost a loved one feel any better. Remember, you’re entitled to your feelings, but be careful who you share them with. You don’t want to say ill things about your ex to your kids. This is why support groups and counseling can really help in these situations. When you experience strong emotions, you may think it will never get any better. The last stage of the grieving process is acceptance and you will get there, on your own time. Don’t compare yourself to anyone else, don’t let anyone tell you how fast you should get over death or divorce, and don’t think there’s something wrong with you if you experience ups and downs during the process, this is all normal. Even in acceptance, you may have times where you feel angry, depressed, or sad, acceptance isn’t a finish line. “Acceptance is often confused with the notion of being “all right” or “OK” with what has happened,” according to Grief. “This is not the case. Most people don’t ever feel OK or all right about the loss of a loved one. This stage is about accepting the reality that our loved one is physically gone and recognizing that this new reality is the permanent reality.” When you are in acceptance, it will be easier to carry on with your life without your loved one, but this doesn’t mean you won’t’ still miss him or her, or won’t have times where you feel vulnerable. Understand that this is normal and don’t criticize yourself or think that you are weak. Your judgement (of yourself or someone going through the process) will only make matters worse. The bottom line is that grief follows loss, regardless of the circumstances. Although we have a model that outlines the stages of this process, it’s not one size fits all and everyone has and is entitled to their own experience. Maile Proctor is a freelance writer and content editor. She has written for Active.com, TakeLessons.com, Life Hack and more. She writes on health and fitness, lifestyle and family, advice, how-to and more. Maile earned her Bachelor's in Broadcast Journalism from Chapman University. When she's not writing, she enjoys hiking in Southern California.